Rugged and sporty, your new Roadster timepiece on the wrist will make you feel like you’re ready for action. You will have the choice between several dynamic looks, whether in 3-hands or chronograph versions, black PVD or stainless steel cases, equipped with a great variety of leather straps and bracelets. Watch hands, numerals and markers are coated with Superluminova, glowing in the dark. 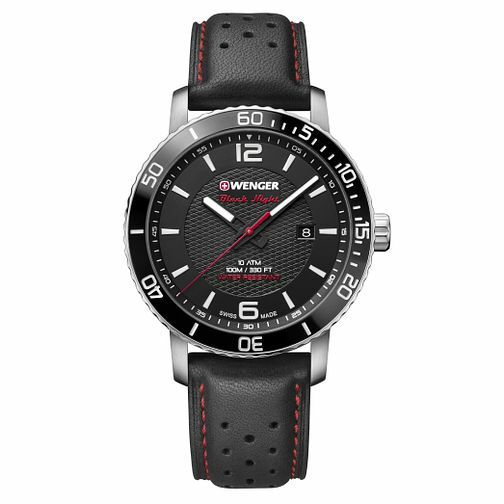 The Wenger Roadster collection is declined in Ø45mm cases Tachymeter or Divers’ bezels. 100m water resistant.